Provence Rooibos is flavory with a floral and fruity bouquet and perfumy, lavender notes. Inspired by the ‘joie de vivre’ of France. 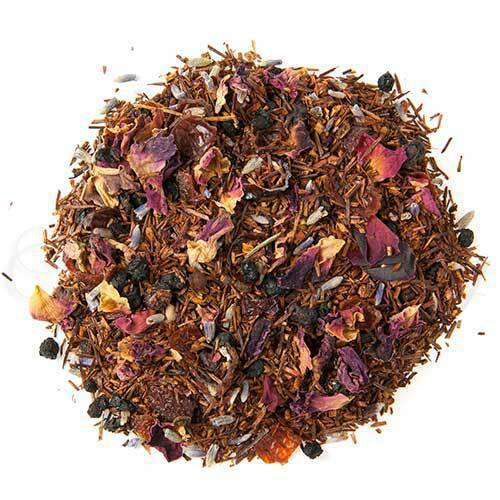 Combines caffeine-free rooibos with rosehip, elderberry, blueberry pieces, lavender, and rose petals. Luxury Ingredients: Rooibos, Rosehip & Elderberry & Blueberry pieces, Lavender & Rose petals, and Natural flavors. An old French saying has it that to spend an afternoon in Provence is to spend an afternoon in heaven itself. The reason for this lies in its altitude above the Mediterranean, crisp clean air and lush foliage. Provence literally teems with gardens, pastures and woodlands. A walk down one of its many country roads will have you stopping to pick wild strawberries, herbs, spices and especially flowers. The abundance of both wild and cultivated flowers growing along the roadside gives the very air of Provence the aroma of a natural perfumery. In a word, Provence is an intoxicating and tranquil place. (Ok, that was 2 words, but it helps illustrate our next point!) That we decided to replicate the experience of a walk in Provence by developing a tea that is at once heady, full of floral character and superbly mellow. We believe that this blend of caffeine free Rooibos and fresh Lavender does just the trick. We also believe you will find it to have a certain je ne sais quois that will inspire you to sit back, close your eyes and dream of an afternoon in the sunshine. Que les jours en Provence sont belles!